Home Styles Biscayne 48 inch Round Outdoor Dining Table is constructed of cast aluminum with a White finish. Features include a powder coat finish sealed with a clear coat to protect finish, attractively patterned table top has center opening to accommodate umbrellas, and nylon glides on all legs. Item Size: 48w 48d 30h. Stainless steel hardware. Stylish dining set with 6 woven chairs, a rectangular table with a decorative, cast center and a 4-panel tile top. All 6 chairs are stationary with tilt motion and are made of weather-resistant material. The ornate frames are durable and painted in a espresso finish. This collection is a blend of classic details and fresh styling, appealing to everyone. 48-inch Round Patio Dining Table in White Finish Home Styles Biscayne 48 inch Round Outdoor Dining Table is constructed of cast aluminum with a White finish. Features include a powder coat finish sealed with a clear coat to protect finish, attractively patterned table top has center opening to accommodate umbrellas, and nylon glides on all legs. Item Size: 48w 48d 30h. Stainless steel hardware. 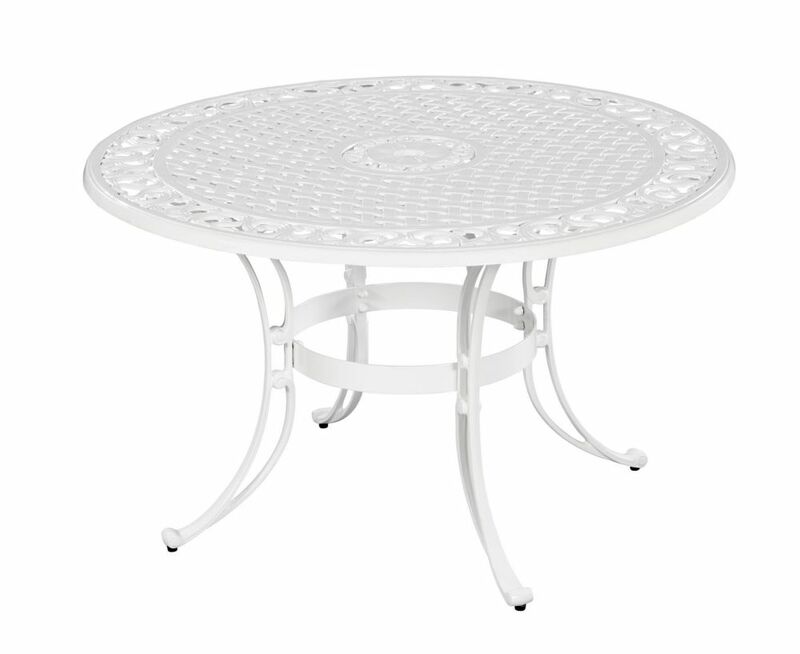 48-inch Round Patio Dining Table in White Finish is rated 4.8 out of 5 by 4. Rated 5 out of 5 by Fred from exactly the table we wanted. We live near the water... exactly the table we wanted. We live near the water and an iron table would rust immediately. Also a great price. Rated 4 out of 5 by PBReed from We searched for a replacement for the white glass top... We searched for a replacement for the white glass top patio table that matched our sling chairs. Surprisingly a white 48 inch table is not easy to locate. The price was right and the table top, with a scroll design, was a nice complement to our more modern white chairs with their forest green sling fabric. The table top added elegance to our deck while still fitting in with our existing furniture. Easy to assemble and level on our deck. I think a small edge on the round table may have dented in shipment (the reason for 4 stars instead of 5)--but the paint did not scratch off. Rated 5 out of 5 by galcal from good quality & attractive This table is very sturdy, heavy and seems well made. We've only had it a couple of weeks, arriving in time for a party poolside. I really like the design of this table and it is fairly even, but I do see small items being able to fall between openings of design. When not in use, we purchased a sturdy cover which is also holding up in high winds. So far reaching its needs. Rated 5 out of 5 by macmomma from Beautifully finished the heavyweight and industrial powder coating on this patio table make it a great value. I ordered the white and it looks terrific. Arrived in perfect condition, not too hard to assemble, I'm an over 60 woman and I did it myself.